As a way to celebrate Oklahoma’s centennial of statehood, I am offering for Lincoln County Newspaper readers a series called “Centennial Cities: Lincoln County’s Hidden History.” Each story will cover a subject about people and places in Lincoln County--some of our history that is little known or underreported. The first touches on Lincoln County’s link to a famous Oklahoma son--Woody Guthrie. When our state celebrates its century mark in 2007 the song “Oklahoma Hills” will surely be sung often and you probably know one of its authors is the famous Okemah native, Woody Guthrie. But you may not know that the song’s other author once called Lincoln County home. Leon “Jack” Guthrie was born in 1915 at Olive in northern Creek County. His father was John Guthrie who was a brother to Charley Guthrie, father of folksinger/songwriter, Woody Guthrie. The John Guthrie family moved to Midlothian southwest of Chandler in Lincoln County in 1931. That year, Jack Guthrie was 16 and in the seventh grade when he enrolled in Midlothian School District 113. 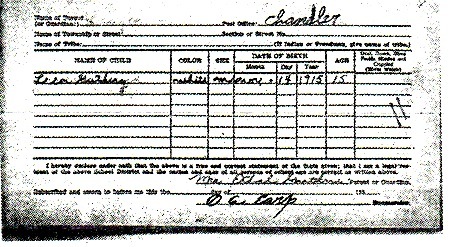 His mother Ethel signed the school census form that was completed by enumerator O. A. Earp. It is on file with other school district census records in the county clerk’s office in the courthouse in Chandler. The story of the writing is legend. Woody was singing on the back porch of a friend’s house and was asked where he came from. After he answered, “I came from the Oklahoma hills,” he jumped up, went inside, and wrote the song in 15 minutes. Later Woody typed what was called a “fake book” of lyrics to about 150 songs, including “Oklahoma Hills.” When the cousins were last together Woody left the book in the back seat of Jack’s car. A friend encouraged him to try his luck at song writing and to use “Oklahoma Hills” as an example for Capitol Records. Cousin Woody had stated publicly and in print that anyone could have any song he wrote and the friend convinced Jack that Woody wouldn’t care. 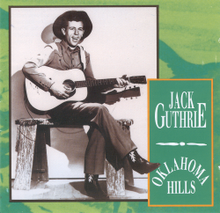 Jack recorded several songs, including “Oklahoma Hills,” on an album called Jack Guthrie and His Oklahomans. When Woody heard his cousin’s version of the song he contacted Capitol to claim it was his. Jack’s position was the song would not have become known if he had not improved and recorded it. After negotiations were over, the copyright was changed to Jack Guthrie and Woody Guthrie. Who knows? Jack Guthrie may have learned about the Oklahoma hills when he lived at Midlothian. It is nice to think that our little spot at the edge of the rolling Oklahoma plains may have been at least part of the inspiration for a song many believe should be the state’s song. In those Oklahoma hills where I was born. While I feel like in those hills I still belong.